For me, 'growing up' suddenly hit very close to home when my eldest niece got married last year. I mean, what the heck? I still remember her as the wriggly baby in my arms! I had just begun college then, myself. She is grown up? When did that happen? What next? My nephews will follow suit soon, then my other niece... and then, my own children? (Oh, gosh! My kids! The younger one is only eight! But in the time it takes me to blink, I will turn around and see a strapping young man standing next to me, and I will wonder the same thing - where did my baby go?) How time flies! Those first steps into adolescence, and later, young adulthood, are exhilarating. Scary, but exciting. Suddenly, there is a brand new world out there to explore. A world where you are not under your parents' shadows. a world where everything is new and shiny and wonderful, a world where darkness and shadows lurk, but they are so far beyond your ken that you do not stop to think of it, a life in which you are immortal. If you look at Hindi films, there were many situations when the person feels that their childhood is being left behind. (It is interesting that all the songs on my list were sung by women. That raises the question: don't men feel the same angst? There is often a longing for those more innocent times that are now lost in the mists of the past, coupled with a nervous anticipation of what life has to offer. Dreams of her youth are just beckoning beyond the vales, yet she realises that she is prey to conflicting emotions. As her feelings yo-yo between happiness and desolation, ostensibly uncontrolled, she wishes for the less-complicated years of her childhood. Waheeda Rehman is suitably bubbly and chulbuli in the picturisation of this song, and is definitely struck by an uncontrollable coyness in the middle. The hero is watching, taking a moment to free himself from the worry of wondering whether he is going to be the next murder victim. Hills and dales? Check. Livestock? Check. Chulbuli-ness? Check. Jokes apart, Rajkumari (Saira Banu) has just been informed by her loving father that she is of an age when he should be thinking of her marriage. She, practical girl that she is, is bidding goodbye to her childhood. It is interesting that even as she bids it to hide somewhere, she is aware that a storm awaits her. Ye safar hai ab mushkil, aane ko hai toofan... is adolescence/early youth really that conflicted? Our third heroine, Begum Para, has no such issues clouding the matter at hand. She is just surprised that this is what it means to cross over into that hallowed age - This is it? one can imagine her thinking. Heck, life is beautiful! And so is she. No doubts there, at all. Why ask anyone else? Her mirror tells her so. Chaand was Husnlal-Bhagatram's debut film as composers. Tanuja's Rita, unlike the others, is searching for her childhood in this sweetly-told tale of a spinster aunt, her schoolgirl niece, and two crusty bachelors. She has looked for her childhood inside her house, she has searched for it in the town and the forest - she wants to know where it has hidden itself, without so much as a by-your-leave. For, the world as she knew it, is changing. If he doesn't fall in love with her, it will not be for want of trying. Nostalgia? Yet, she (Shashilkala) is the daughter of the house, loved and pampered. On the other hand, her adopted sister (Nutan), beti jaisi, who, despite her amorphous relationship with her mother, hums her happiness at being alive! These girls are not bidding goodbye to childhood or welcoming youth as much as they are celebrating it. There is such life, such zest for living, such sheer happiness that one cannot help smiling along with the bevy of girls, who crowd the road on their bicycles. And Nutan, glorious, smiling Nutan, wishes for a compatible person to share the experience. There is an expressed wish for love, for happiness, for someone (several someones) who will fill their lives with the colour of love. If Rajkumari in Junglee wanted her childhood to go away, never to return, then, Roopa (Vyjayanthimala) is begging her childhood to stay, but unfortunately, her childhood is just a visitor, and has to leave. But like the others, she too is prey to many different emotions, and they are driving her mad. Why is it that she suddenly feels shy? Or needs to hide from the world? Whom can she talk to, now that her childhood is gone? Can't it stay? Like Banke panchchi gaaye pyar ka tarana, this song too is a celebration of life in the present. It is also so much more. It is a celebration of happiness, of breaking away from what is considered 'proper', of being able to live life her own way, unencumbered by restrictions. So ends my list, but surely there are other songs? Which song would you say best describes this stage of your life? What would you add? Why? I saw the title and thought of a song - it was the first one in your list. Another one came to mind, I scrolled down and it was the second in your list. Luckily the third song which came to me turned out to be no. 7 in your list! I will read the rest of your post now and reflect on my younger days. Interesting choice of topic, as always! However do you get these brilliant ideas? One song comes to me -panchhi ban mein ... From Babul. 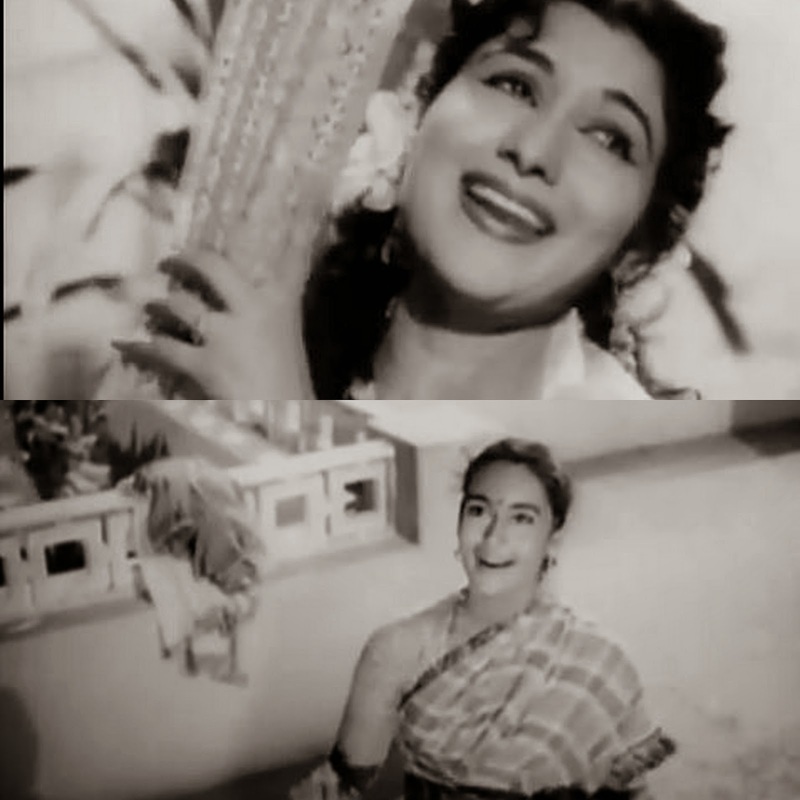 Nargis looks so young and carefree in this scene. It is similar to the mood in the song from Anari. How about Aaj main jawab ho Gayi hoon ...? Since I am flat on my back right now, reeling from a horrible virus, I will post the links to the songs later. *grin* I know how that feels. The songs you mentioned are so symbolic of this theme, are they not? Can't blame you for thinking of those even before reading my post. You know, Ava, I had just recently listened to the songs of Babul; yet, when I was writing this post, I completely forgot about them. Both you and Lalitha have added songs that fit my theme so well. Thank you for that. Gaya bachpan does fit the theme (not a song I would pick, but still...) because it is what happens to a girl when her childhood is gone and her youth beckons her. I think, though, by this time, music had begun to nose-dive from the heights it had attained. Raakhee looks so beautiful, but I shudder at the picturisation. Why on earth would she be rolling on the ground? At a party? Thanks for the links though. They *are* part of the same theme anyway. Thanks a lot for this lovely post that brought back pleasant memories. Interesting subject,but what I really liked was your introduction, very well written and sort of expresses what we all feel but perhaps do not know how to put into words. You have compiled a perfect list. I have 2 songs but one of them doesn't fit here, it is my all time favourite,the song expresses the sudden joys of realizing you are growing up, it is from Sound of Music,I am 16 going on 17 the other song is from Ashirwaad ek tha bachpan. I absolutely relate to the lyrics, it finds an echo in my heart, after all my father was a part of my childhood, I sometimes wonder how it would have been, had he been a part of my and adult life. Truth to tell, I do not like Bachpan ke din bhula na dena. :) I had the Tere bachpan ko on my long list, but I was thinking more along the lines of growing up and being nostalgic about your childhood, as you mentioned. So I dropped it. But yes, these are all songs about childhood and if you take Songs of Innocence literally, Tere bacpan ko would fit right in. I'm so glad you enjoyed the post. That makes writing worthwhile. Obviously, I had never heard the Hemant Kumar song before. Thanks for introducing me to it. You are right, it is sweet. Ek tha bachpan is a song I had forgotten about even though I liked the film very much. Thank you for the links. Thank you very much for the appreciation, Shilpi. I am sixteen is one of my favourite songs, so I'm glad you wrote about it. I'll post the link here, even if it is not a Hindi song. Beautiful write up (as usual!). Some great songs. I was very pleased to find Bachpan ki yaad dheere dheere here. I am also very fond of Sapne suhane ladakpan ke, Panchhi bani udati phirun, Ban ke panchhi gaye pyar ka tarana. Madhu's addition of Hemant Kumar's non-fim song is also very good. Going through the list I was also waiting for Bachpan ke din bhula na dena. A bachpan song I like a lot is by your 'besura' singer. While it talks about all the good things they did in the childhood, Dharmendra's sour face shows something has gone wrong between the lovers? :) Welcome to my blog. Thank you for reading and commenting. :) - you're sure to find it on the internet for download. Quite commendable...see if it is on youtube.com/movies. I haven't seen Drishyam, Maddy, though I have heard very good things about it. It will have to wait until I go to India next, so I can buy the DVD. I don't recall anyone mentioning Thira. Thanks for the recommendation. I will put it on my to-buy list of movies. What was the reason that Rk did not allow any great artist to be associated with his magnanimous RK production Movies be it Lyricist Majruh Sultanpuri / Sahir Ludiyanvi / shkeel badayuni / kaifi azmi / jaan nisaar akhtar // music maestro Naushaad , even he ignored the super heroins like Sairabanu , wahida rehmaan, minakumari and all time great singer of Indian film industry Mohammad Rafi , just because of their relegion or some other reason Allah jane ! Great review! I agree with you about the last section of the film and how conveniently everything works out in the end. However I loved the emphasis on food and the many scenes set on the beach which added so much atmosphere to the film. Also loved the fact that this was set in a Muslim community but as you say the religion was not important - it just was a story set in this particular community but could have been anywhere. Thank you, Heather. I did like this film quite a bit and that had a lot to do with the performances, and the staging.